April-secured U.S. Exchange monthly-paid (MoPay) dividends, upsides, and net-gains: 1. Stocks by yield >1% (94); 2. Stocks by price-upside (30); 3. Closed-End-Investment-Companies, Exchange-Traded-Funds & Notes (CEICs/ETFs/ETNs) by yield (80). U.S. MoPay equities expanded numbers (not gains). Canadian MoPays are omitted. CEICs/ETFs/ETNs are combined and limited to yields over 7.2%. Items: 1. Top MoPay stock gains; 2. Overall best MoPay gainers; 3. Funds vs.Equities; 4. Fund risks/rewards. All per prices as of 4/11/19. 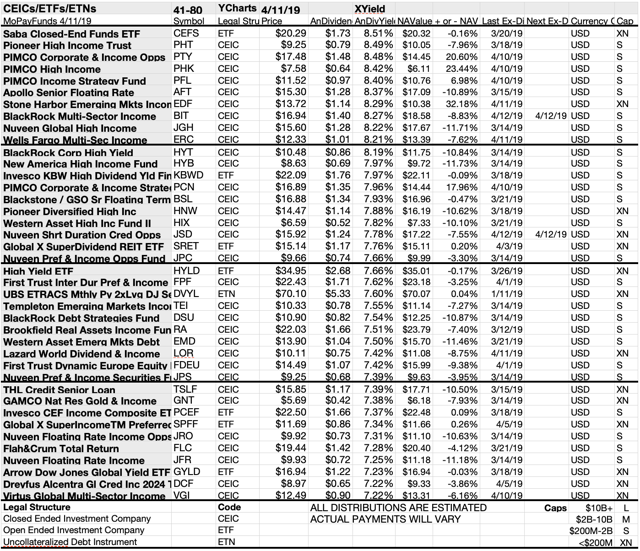 Analyst annual targets revealed that investing $5k in the lowest priced five of ten top yield MoPay US exchange equities produced 10.36% more gain than $5k invested in all ten. Six of the ten top-yield MoPay stocks (shaded in the chart above) were verified as being among the top-ten gainers for the coming year based on analyst one-year target prices. Thus, the yield-based strategy for this MoPay group, as graded by analyst estimates for this month, proved 60% accurate. PermRock Royalty Trust (PRT) netted $742.85, based on dividend plus the median of target price estimates from four analysts less broker fees. A Beta number was not available for PRT. Great Elm Capital Corp (GECC) netted $437.00 based on a median target price estimates from two analysts, plus dividends less broker fees. A beta number was not available for GECC. Global Net Lease Inc (GNL) netted $381.36 based on a mean target estimate from three analysts, plus estimated annual dividends less broker fees. The Beta number showed this estimate subject to volatility 29% less than the marker as a whole. Capitala Finance Corp (CPTA) netted $331.60, based on dividend, plus the median of target prices estimated by six analysts, less broker fees. The Beta number showed this estimate subject to volatility 14% more than the market as a whole. Whitestone REIT (WSR) netted $197.81 based on a median of target price estimates from six analysts, plus dividends less broker fees. The Beta number showed this estimate subject to volatility 14% more than the market as a whole. PennantPark Floating Rate Capital Ltd (PFLT) netted $169.48 based on dividends plus the median of annual price estimates from six analysts less broker fees. The Beta number showed this estimate subject to volatility 29% less than the market as a whole. 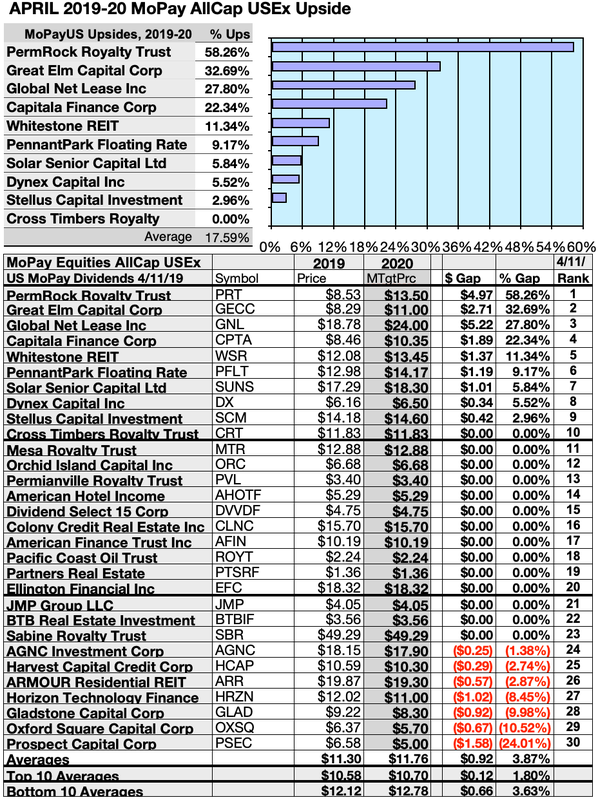 Mesa Royalty Trust (MTR) netted $164.79 based on just estimated annual dividends less broker fees. The Beta number showed this estimate subject to volatility 18% more than the market as a whole. Dynex Capital Inc (DX) was forecast to net $162.09 based on mean target price estimates from four analysts plus dividends less broker fees. The Beta number showed this estimate subject to volatility 40% less than the market as a whole. Solar Senior Capital (SUNS) netted $132.63 based on the median of target estimates from three analysts, plus dividends less broker fees. The Beta number showed this estimate subject to volatility 40% less than the market as a whole. Orchid Island Capital Inc (ORC) netted $133.70 based on just estimated annual dividends less broker fees. The Beta number showed this estimate subject to volatility 59% less than the market as a whole. Average net gain in dividend and price was 28.5% on $1k invested in each of these ten MoPay stocks. This gain estimate was subject to average volatility 35% less than the market as a whole. Prospect Capital Corp (PSEC) cast a loss of of $140.72 based on dividend and a projected target price estimate based on the median of projected target price estimates from three analysts, including $10 of broker fees. The Beta number showed this estimate subject to volatility 20% more than the market as a whole. Stocks earned the "dog" moniker by exhibiting three traits: (1) paying reliable, repeating dividends, (2) their prices fell to where (3) yield (dividend/price) grew higher than their peers. Thus, the highest yielding stocks in any collection became known as "dogs." More specifically, these are, in fact, best called "underdogs". Three lists produced numerous actionable conclusions and several more un-numbered results. To draw these conclusions and results, March 15 closing prices and estimated annual dividends were referenced from YCharts. 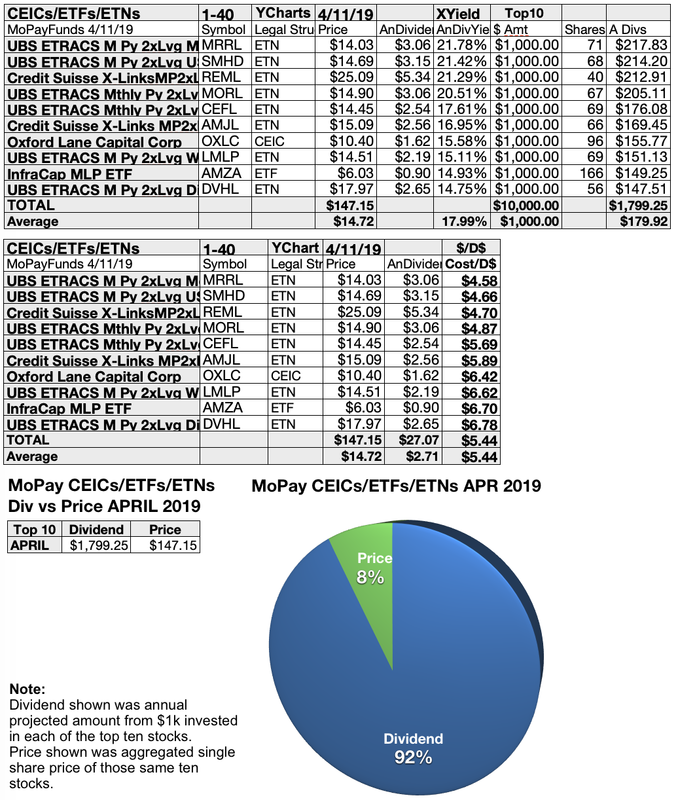 Monthly pay (MoPay) equity (1) yield and (2) upside potential lists were compared and contrasted against (3) a high yield (and higher risk) MoPay CEICs/ETFs/ETNs list. Quarterly, Semi-Annual and Annual dividend investors anxiously await announcements from a firm, fund, or brokerage to learn if their next dividend will be higher, lower, or paid at all. Monthly pay stocks, funds, trusts, and partnerships inform the holder every four and one third weeks by check and/or statement. If the entity reduces or suspends a payment, the holder can sell out of the investment immediately to cut future losses. This advantage has been curtailed when companies suddenly cut monthly dividends to save cash. Three prominent MoPay firms declared dividend cuts between December 2016 and March 2017. Former MoPay top ten regular by yield. Blue Bluerock Residential (BRG) announced in December it is retreating to quarterly dividend payments "in keeping with industry tradition." Third, Capitala Finance Corp (CPTA) cut its monthly payout from $0.13 to $0.0833 as of October 30, 2017. For the past year, Tahoe Resources (TAHO) has skipped its monthly payouts and dropped as a MoPay resource. Top yield stock for October 2016, Orchid Island Capital (ORC), released this cautionary note with its monthly dividend announcements: "The Company has not established a minimum distribution payment level and is not assured of its ability to make distributions to stockholders in the future." ORC directors proceeded to back-up their words with actions cutting the dividend from $0.14 to $0.11 in February 2018, to $0.09 in March, and to $0.08 for September. The U.S. MoPay segment is volatile, transitive, and shrinking. More over-the-counter trades in monthly pay equities are available from Canadian firms, many of which are picking up U.S. OTC authorization. 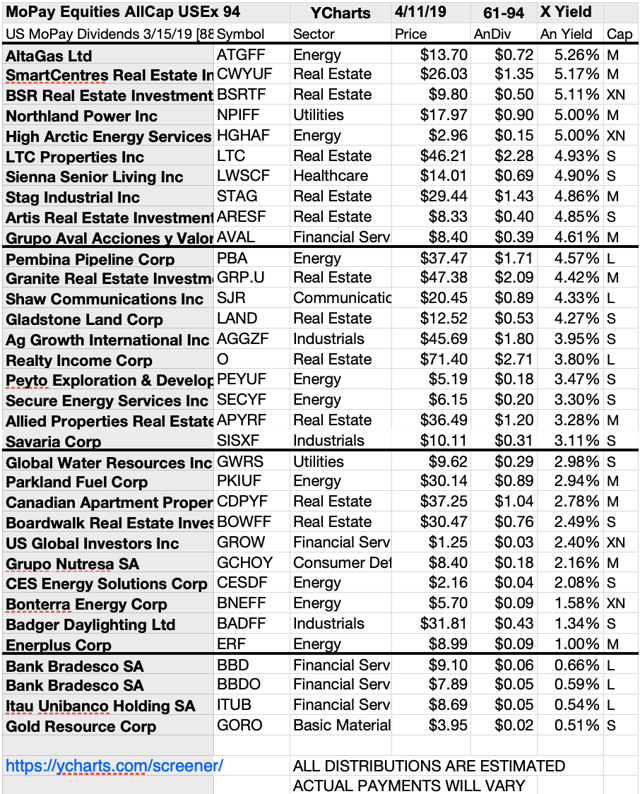 Top ten of these US exchange listed monthly pay dividend equities showing the best yields into April represented three of the eleven Morningstar market sectors, with representative firms split 3 to 4 to 3 between the energy, real estate, and financial services sectors. Tops for April was the first of three energy sector representatives, Mesa Royalty Trust (MTR) . The other two energy equities placed second and fourth, PermRock Royalty Trust (PRT) , and Permianville Royalty Trust (PVL) . The top of four real-estate equities placed third, Orchid Island Capital Inc (ORC) . The other three real estate dogs placed sixth, eighth, and tenth in the top ten: American Hotel Income Properties REIT LP (OTC:AHOTF) ; AGNC Investment Corp (AGNC) ; Dynex Capital Inc (DX) . The first of three financial services representatives placed fifth, Oxford Square Capital Corp (OXSQ) . The other two Financial firms placed seventh, and ninth, Great Elm Capital Corp (GECC) , and Capitala Finance Corp (CPTA) . These completed the April MoPay top ten list by yield. The results shown below from YCharts for MoPay dividend stocks as of market closing price April 11 were paired with analyst mean target prices one year out. Ten top stocks displayed 0% to 56.25% price upsides for the next year based on analyst 1 yr. targets. Four of the ten (tinted) on this price upside list were members of the top ten list by yield. In first five places on this upside list were Great Elm Capital Corp (GECC) , Capitala Finance Corp (CPTA) , Global Net Lease Inc (GNL) , Vermilion Energy Inc (VET) , Whitestone REIT (WSR) . The lower level five were, PennantPark Floating Rate Capital Ltd (PFLT) , Solar Senior Capital Ltd (SUNS) . Dynex Capital Inc (DX) , Stellus Capital Investment Corp (SCS)  and Orchid Island Capital Inc (ORC). Price upside, of course, was defined as the difference between the current price and analyst target one-year median price targets for each stock. Those ten MoPay stocks showing the highest upside price potential into 2020 were gleaned from 30 selected by yield. Three to nine analysts have historically provided the most accurate median target price estimates. 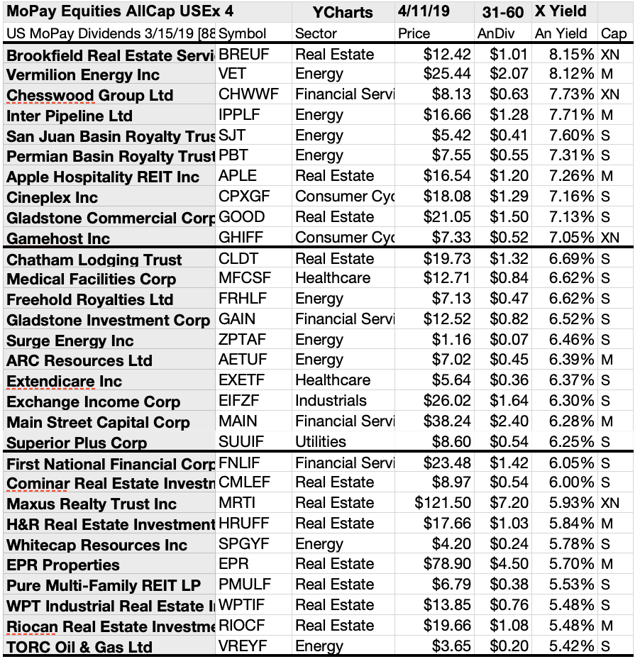 Eighty top monthly dividend paying (MoPay) Closed End Funds, Exchange Traded Funds and Notes listed below were culled from nearly 800 candidates. Yields greater than 14.1% calculated as of April 11 determined the top ten. 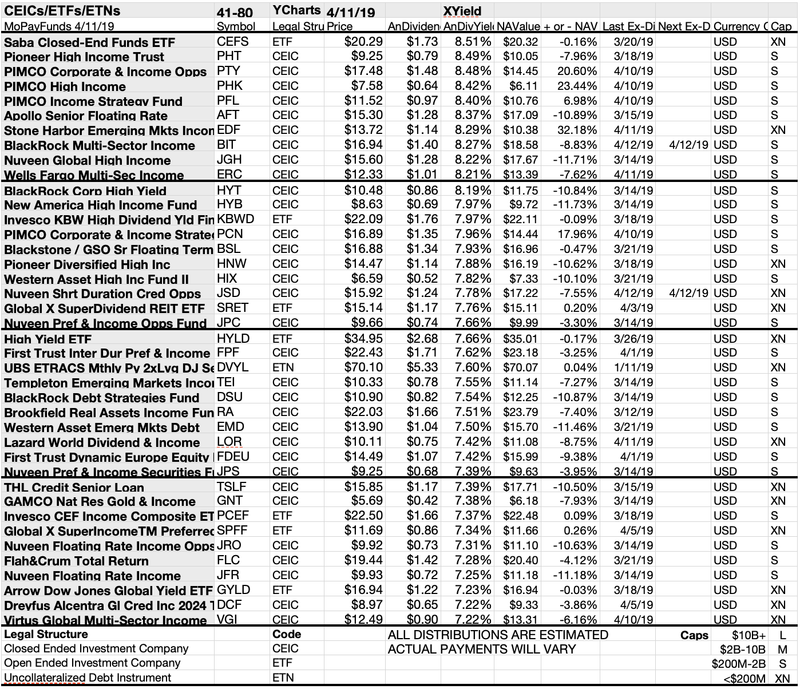 The top ten monthly paying dividend investment companies, funds, & notes showing the biggest yields for per YChart & YahooFinance data featured eight uncollateralized debt instruments [ETNs], one open ended investment company [ETF], and one closed-ended investment company [CEIC]. 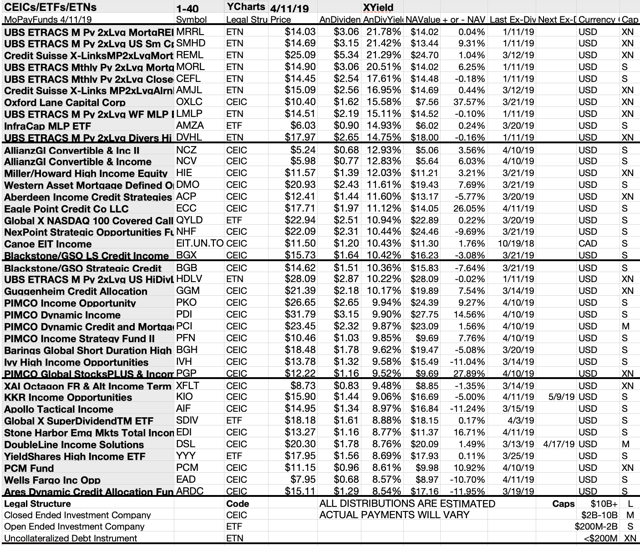 Uncollateralized debt instruments (ETNs) captured the first, through sixth and eighth positions: UBS ETRACS M Py 2xLvg MortgREIT ETN SerB (MRRL) ; UBS ETRACS M Py 2xLvg US Sm Cp HiDiv ETN (SMHD) ; Credit Suisse X-LinksMP2xLvgMortREIT ETN (REML) ; UBS ETRACS Mthly Py 2xLvg Mortg REIT ETN (MORL) ; UBS ETRACS Mthly Py 2xLvg Closed-End ETN (CEFL) ; Credit Suisse X-Links MP2xLvgAlrnMLP ETN (AMJL) ; UBS ETRACS M Py 2xLvg WF MLP Ex-Energy ETN (LMLP). One Closed End Investment Company placed seventh, Oxford Lane Capital (OXLC) , and one ETF placed ninth on this list, InfraCap MLP ETF (AMZA) . 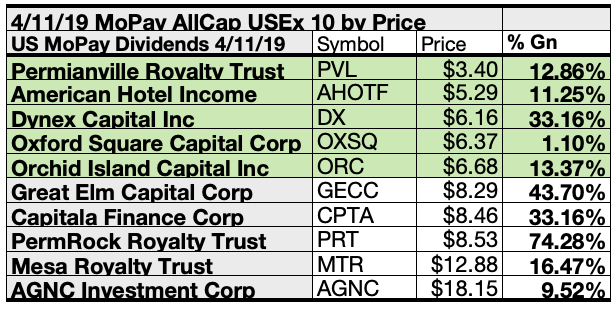 This completed the top ten Exchange Traded Notes, Closed End Investment Companies, and Exchange Traded Funds list for April, 2019. Note that the top ten equity dividends are now priced lower than those of the top ten funds. This is a new variation in the dividend dog kennel. Still it makes sense, the funds have no accountability for the dividends collected from investments or the money generated from trading. They report only cash flow and returns generated. Dividend equities, however give you a monthly comparative report of price value versus dividends paid. Since June 2012 reader suggestions to include funds, trusts, and partnerships, a list of MoPay equities to buy and hold in September 2012 resulted from those reader suggestions supplemented with a high yield collection from here. That list was supplemented by an upside potential article in October and a upside vs. buy & hold in November. Another list factored December 2012 reader comments. In January, February, March, April, May, June, July, August, September, October, November, and December 2013 readers contributed. Reader suggestions continued in 2014 following the January, February, March, April, May, June, July, August, September, October, November, and December articles. 2015 continued with readers contributing in January, February, March, April, May, June, July, August, September, October, November, and December. The 2016 articles in January, February, March, April, May, June, July, August, September, October, November, and December. The 2017 articles of January, February, March, April, May, June, July, August, September, October, November, and December. Again last year, the 2018 articles in January, February, March, April, May, June, July, August, September, and October/November, and December. 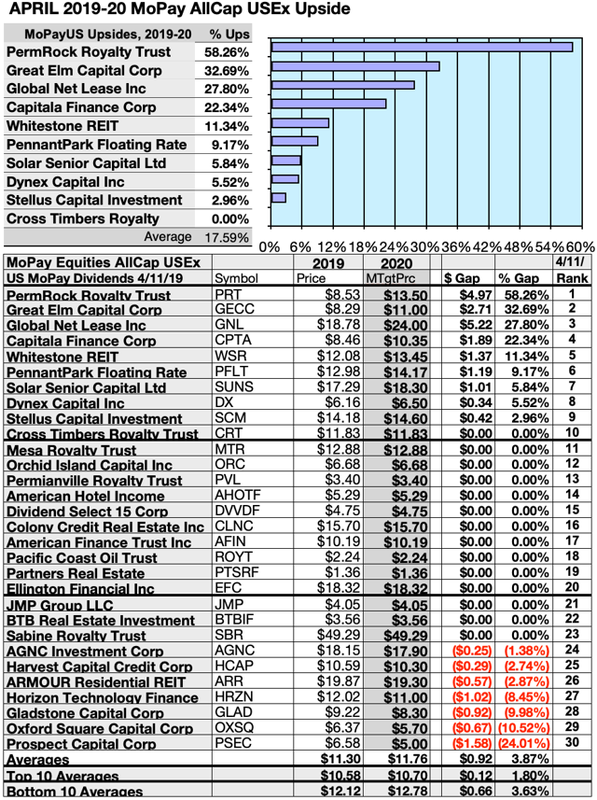 Now we have a new year of 2019 articles in January, February, and March, continuing to compare and contrast MoPay equity upside potential to the now lower yield (but higher risk) buy and hold Exchange Traded Funds and Notes. 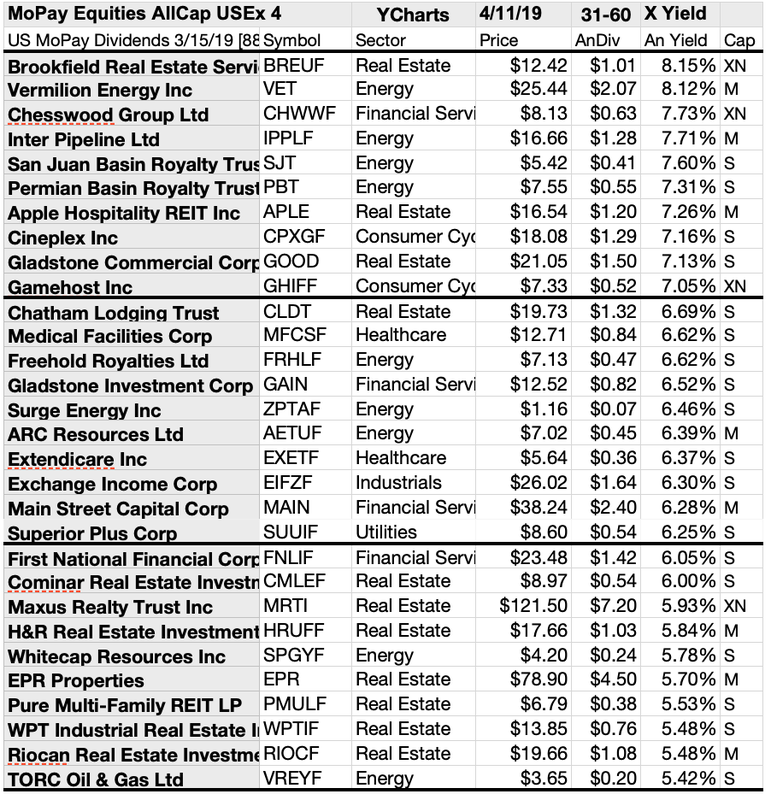 Ten monthly pay stock equities were ranked by yield. Those results, verified by YCharts and Yahoo Finance, produced the following charts. $5000 invested as $1k in each of the five Lowest priced stocks of the top ten MoPay dividend dog kennel by yield were predicted by analyst 1 year targets to deliver 50.85% LESS net gain than $5,000 invested as $.5k in all ten. 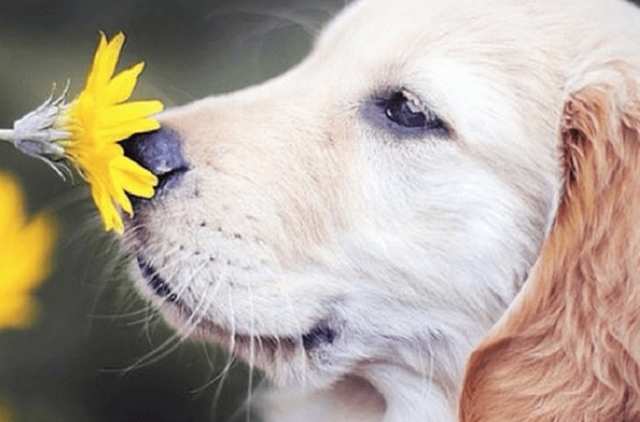 The seventh lowest priced MoPay dividend dog, Great Elm Capital Corp (GECC), was predicted to deliver the best net gain of 45.37%. 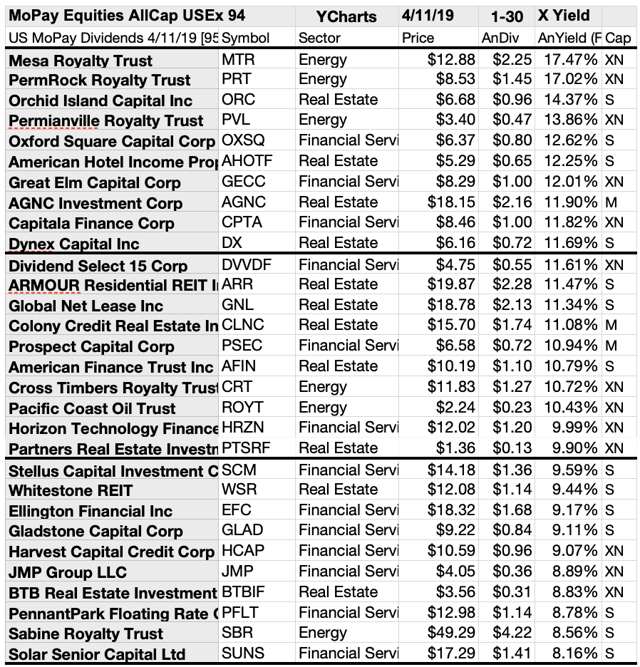 Lowest priced five MoPay dividend stocks estimated April 11 were: Permianville Royalty Trust (PVL); American Hotel Income Properties REIT LP (OTC:AHOTF); Dynex Capital Inc (DX); Oxford Square Capital Corp (OXSQ; Orchid Island Capital Inc. (ORC), with prices ranging from $3.40 to $6.68. 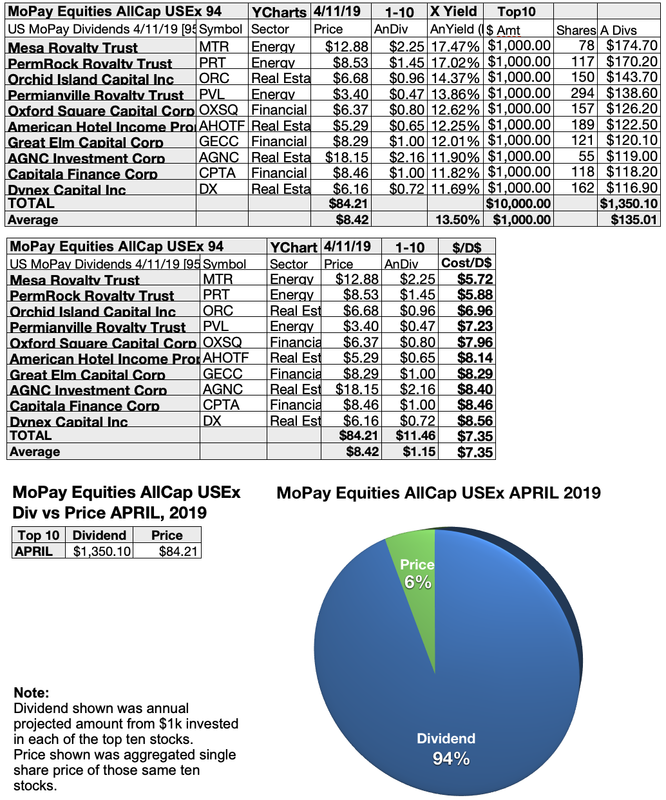 Higher priced five MoPay dividend equities estimated April 11 were: Great Elm Capital Corp (GECC); Capitala Finance Corp (CPTA); PermRock Royalty Trust (PRT); Mesa Royalty Trust (MTR); AGNC Investment (AGNC), whose prices ranged from $8.29 to $18.15. This distinction between five low priced dividend dogs and the general field of ten reflects the "basic method" Michael B. O'Higgins employed for beating the Dow. The same technique, you now see, can also be used to find some rewarding dogs in the MoPay Stock kennel. The added scale of projected gains based on analyst targets contributed a unique element of "market sentiment" gauging upside potential. It provided a here and now equivalent of waiting a year to find out what might happen in the market. Its also the work analysts got paid big bucks to do. Gains/declines as reported do not factor-in any tax problems resulting from dividend, profit, or return of capital distributions. Consult your tax advisor regarding the source and consequences of "dividends" from any investment. Stocks listed above were suggested only as decent starting points for your MoPay dividend stock purchase or sale research process. These were not recommendations. Sources: Graphs and charts were compiled by Rydlun & Co., LLC from data derived from YCharts, dividend.com, and finance.yahoo.com; analyst mean target price by Thomson/First Call in Yahoo Finance. Disclosure: I am/we are long MFCSF. I wrote this article myself, and it expresses my own opinions. I am not receiving compensation for it (other than from Seeking Alpha). I have no business relationship with any company whose stock is mentioned in this article.